Having heard precisely zilch home cinema-wise since 2008 from the once-prolific projection brand InFocus, I'd begun to wonder if it had become another victim of the global recession. But rumours of its demise were evidently greatly exaggerated, for the company is back, with the ScreenPlay SP8602. The ScreenPlay name isn't actually new; InFocus used it first in 2004. But the SP8602's design is a total departure from InFocus projectors of the past, ditching the brand's previous predilection for curves and small footprints in favour of a large, elongated rectangular design with a predominantly matt black body, grille effect down the side and silver trim. The SP8602's bulky shape gives you the impression that InFocus has opted for practical matters like optical quality and reducing cooling noise over shallow aesthetic concerns. That said, the InFocus SP8602 isn't devoid of frivolity. For instance, the backlit and strikingly simple remote control has actually been designed to look like a miniature version of the projector. I love it, though our Tech Labs aren't as impressed, bemoaning the fact that the menu button is sited next to standby. Then there's the selection of interchangeable 'skins' InFocus does for the SP8602. You can swap the standard matt black top panel for white, gloss black and even walnut wood alternatives. Plus you can get a pre-primed skin onto which you can apply your own colour. InFocus' frivolity spills over into foolishness, though, with the extraordinarily bright, neon blue circle of light that wraps around the lens in the SP8602's out-of-the-box state. Intended to give you an exceptionally obvious means of knowing when your projector is powering down or up, all you really notice is the blue pall the light ring casts over pictures until you turn the feature off. This is possibly the most bonkers flourish I've ever seen added to a projector. Setting up the SP8602 wasn't all plain sailing. For instance, while the projector does carry vertical and horizontal image shifting knobs (which you have to remove a panel to gain access to), these knobs elicit an imprecise and 'lightweight' response from the optics. A firmware upgrade released has now added additional horizontal and vertical shift controls to the advanced picture menu, giving you some extra digital control. The SP8602's 1.5x optical zoom isn't as flexible as I'd have hoped from a mid-range projector, either. 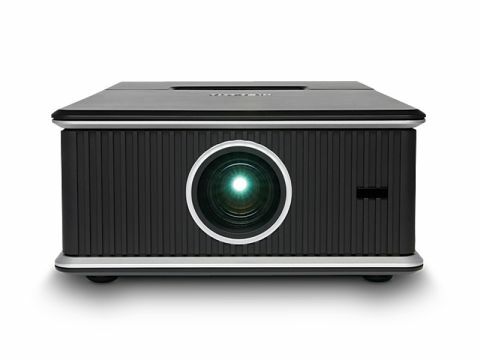 Yes, there is a digital zoom feature on board, via which the projector digitally reduces the image for use in rooms with long throw distances, but home cinema purists are likely to run a mile from such a compromise. The SP8602 is well-connected, though, with highlights of two HDMIs, three component ports (which I'd actually happily trade two of for a third HDMI), three 12V trigger ports (which will definitely appeal to custom installers), and a Serial control bus. The image flexibility delivered via the projector's onscreen menus is prodigious too – so much so that the projector has been endorsed by the video boffins at the Imaging Science Foundation (ISF), and DIY tweakers will be over the moon. Adjustment highlights include red, green and blue gain and offset adjustments; a startlingly customisable noise reduction system; themed gamma presets, motion-smoothing processing; Texas Instruments' BrilliantColour feature; and the option to adjust the projector's iris across 10 manual settings, or to an Auto mode. The Auto mode is a non-starter, since its effects on the picture are too strident. But the manual settings are certainly worth experimenting with if you have a darkened room; the 50-60 per cent level – with the lamp output set to low – worked best for me. Although it takes a little experimentation to get there, the InFocus SP8602 really can produce excellent images for its three grand price tag, thanks in particular to their impeccable insight – especially with HD. What do I mean by 'insight'? First, HD images look exceptionally sharp and detailed (provided you've got the NR processing and Over-scanning off). Next, colours are rendered with mostly very natural tones and outstanding finesse, in that there's no trace of the colour striping or skin tone blotching sometimes seen with DLP projection. Also helping you get the most from your hi-def sources is the SP8602's talent for producing impressive levels of shadow detail from dark image parts – something made possible by the fact that it has a more than respectable native contrast performance (claimed at 5,000:1, and measured at higher than that by our Tech Labs), so you don't have to take too much brightness out of pictures to achieve good black levels. Additionally, the SP8602's pictures are relatively untroubled by those twin DLP issues of the rainbow effect and fizzing noise over motion. It handles motion generally very agreeably, in fact. With InFocus' Motion Smoothing feature switched in, images look almost unnervingly smooth – though there's a little shimmering around the edges of moving objects. If this aggravates you, the SP8602's motion still looks good even with the Motion Smoothing technology turned off. I found the only real blights on day-to-day enjoyment of the SP8602 are both 'mechanical' issues. Firstly, despite being markedly quieter than previous InFocus projectors, I still sometimes noticed the SP8602's rather high-pitched running noise, even when using the Eco lamp setting. Secondly, the projector seems bizarrely clumsy at switching between input formats. If you swap from an HD to a non-HD channel on Sky, for instance, the SP8602 goes into meltdown, with all sorts of flickering screen and whirring fan shenanigans before the image finally appears. While I'm duty bound to acknowledge the InFocus SP8602's various foibles, the fact is that they only make up a relatively small part of your experience with this projector. In other words, once you've managed to get the SP8602 set up, the only thing you'll really notice for the vast majority of the time is a picture performance that's as good as anything the mid-range projector scene has ever produced.